Imagine if you were one of the people in Greeley, Colorado, who had been stuck in traffic for hours, because unknown chemicals that had “something to do with fracking” had been spilled in the road. What sort of questions might have run through your mind? First responders­ included Greeley’s Fire and Police Departments and Colorado’s State Patrol and Transportation Department. Everyone was trained in hazardous material spills­–but no one knew what had been spilled. How can first responders protect themselves and the public if they don’t know what they are dealing with? Should people have been evacuated from the vicinity instead of sitting around for hours breathing unknown chemicals? Fracking fluid and industrial cleaning fluids are likely to contain volatile hydrocarbons that evaporate and create a health hazard. Why hadn’t the shipper, Clear Water Products, provided the City of Greeley with appropriate safety information such as Material Safety Data Sheets as part of a permit to transport the chemicals in the first place? Why wasn’t the container labeled so the hazmat crew knew what they were dealing with and could take appropriate and timely actions? What if it had been raining? Would the spilled chemicals have gone down storm drains and into a wastewater treatment facility? These facilities are not designed to handle industrial chemicals. Would the chemicals have washed into nearby waterways? Spilled chemicals don’t go “away”; they go somewhere–into the air, the water, the soil––into us. No injuries were reported, but chemical injuries often go unnoticed and unreported, because the body’s initial warning signs of overexposure are so commonplace. Watery eyes, a headache, a persistent cough or clearing of the throat, sneezing, a runny nose, or trouble breathing can all be your body warning of danger or a very unhealthy situation. Maybe these symptoms clear up right away. Maybe they don’t. Would you remember that a headache had started three days ago when you sat in backed up traffic and breathed unknown chemicals? Oil industry accidents like what happened in Greeley are happening more often and in more towns, cities, and neighborhoods across America. There is a lack of industry transparency about what is being transported–and the risk to the exposed public. For example, when the BP refinery in Whiting, Indiana, spilled oil into Lake Michigan on March 24, people wanted to know what type of oil it was. The refinery now processes 85 percent tar sands, a type of oil that sinks when spilled unlike conventional crude. Residents were concerned, because Chicago’s six water cribs provide drinking water for some 10 million people and the cribs are 200 feet beneath the lake surface. 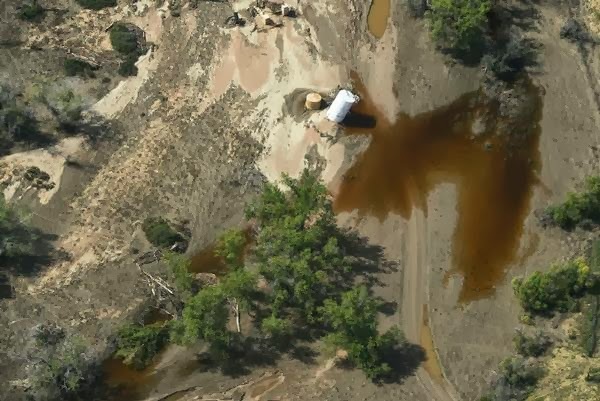 One crib was only two miles from where the “crude oil” was spilled. How far would heavy oil travel along the lake bottom? It’s likely no one knew––or wanted to admit. Residents have yet to learn what spilled. It doesn’t have to be like this. The risk is more obvious when rail cars carrying flammable Bakken crude oil derail and explode, but this is after-the-fact. Much more should be done up front to minimize the risks from tar sands and volatile oils and the toxic stews of chemicals that are used to extract, dilute, process, or otherwise handle petroleum. Currently, 25 million Americans live so close to rail lines that they would have to be evacuated during an explosion or fire involving a rail car carrying oil. Millions more live near pipelines carrying tar sands oil. Even more live in proximity to fracking wells now known to be harmful to human health. The problem is that the rapid expansion of hydraulic fracturing activities and tar sands transportation through our communities and regions, and the rapid expansion of offshore oil production, have not been met with meaningful advances in oil spill prevention and response policies and practices. We believe “eventually” is now and that similar programs – independent of oil industry and government control – are needed in regions at risk of oil activities such as the multi-state transportation corridors for tar sands pipelines or crude-by-rail ways. We are working to create teams of locally empowered and engaged citizenry through a two-step process. First, ALERT trainers with hands-on experience in oil spills, petrochemical exposure, health impacts, and oil policy/litigation are invited into communities to share their knowledge and skills. Through repeated visits and extended stays, our trainers identify and network local resources, partnering with groups or universities to build regional capacity. We also encourage citizens to join Local Emergency Planning Committees (LEPCs) and provide support to help them learn about the types of petrochemical products, the human health risks of the products, where pipelines and rail cars are routed, areas of vulnerable or special needs populations like school children or hospitals, and emergency procedures including community right-to-know. Next, ALERT trainers will help integrate meaningful citizen participation oil spill prevention and response planning in local areas through formation of councils or teams dedicated to this purpose. The Prince William Sound Regional Citizens’ Advisory Council, in particular, is an extraordinary example of ordinary citizens working with industry and government to hold the oil industry accountable to the people and reduce the risk of accidents from oil industry activities. Applying these lessons to other regions, informed citizens could advocate, for example, more robust and safer rail cars, proper labeling and notification of routes, “no go zones” near vulnerable populations or water supplies, or de-gassing of highly volatile Bakken shale before shipment through their area. Further, these teams could develop plans to protect the public and workers during oil disasters. Yes, but how? Citizens already have the legal authority to form these councils or teams. The implementing regulations for the National Contingency Plan are up for revisions and will be open for public comment as early as December. The ad hoc Citizens’ Coalition to Ban Toxic Dispersants, now spearheaded by ALERT, has written a detailed description for creating more citizens’ councils (Section 300.206), including a list of suggested stakeholders such as representatives of landowners, public health advocates, local businesses, environmental and environmental justice advocates, along with duties and responsibilities. Funding would come from the Oil Spill Liability Trust Fund, also created through the Oil Pollution Act of 1990. Anything is possible but it starts with informed, engaged citizens. ALERT is committed to making healthy people and healthy communities part of our energy future. Please help us make ALERT happen!